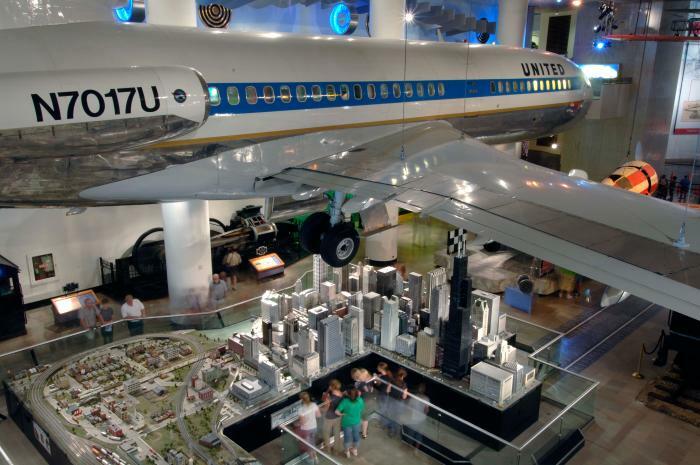 Explore the largest science museum in the Western Hemisphere. MSI is home to more than 35,000 artifacts and hundreds of exhibits, spanning 14 acres of space. Climb aboard a WWII German U-Boat. Plunge into a working coal mine. Take a tour of your digestive system. Control a 40-foot tornado. And that&apos;s just the beginning. Opened in 1933, MSI is located within the only remaining building from the 1893 World&apos;s Columbian Exposition. This Beaux Arts structure was originally the expo&apos;s Palace of Fine Arts, displaying works of art from around the world. Now, through interactive exhibits, daily live science experiences and tours, special events, and 3D screenings in the five-story, domed Omnimax, the fascinating worlds of science, technology, medicine and engineering are revealed. The Science Behind Pixar: Get a unique look into the Pixar process, and explore the science and technology behind beloved animated films and their characters, including Buzz Lightyear, Dory, Mike and Sulley, Edna Mode, and WALL•E. Opens May 24, 2018. Numbers in Nature: A Mirror Maze: Get lost in an elaborate, immersive mirror maze that reveals the mathematical patterns inherent in nature, from the lines on our skin to the ridges of mountain ranges. Numbers in Nature features nearly 20 activities and more than 30 artifacts to break down concepts like the Golden Ratio. YOU! The Experience: Experiment with nearly 50 fun, cutting-edge interactive displays while exploring what it means to live a vital, healthy life in the 21st century. Use your own heartbeat to make the museum&apos;s 13-foot Giant Heart come to life; get moving on a human-sized Hamster Wheel; and examine actual human specimens that showcase the extraordinary complexity of the body. Science Storms: A massive, two-story exhibit unravels the mysteries of physics and chemistry through recreations of nature&apos;s most powerful phenomena: tornados, lightning, fire, tsunamis, sunlight, avalanches and atoms. Manipulate a 40-foot tornado and see the vapor whirling before you. Witness giant bolts of lightning crackling above. And trigger an avalanche using a 20-foot avalanche disk. The Great Train Story: Watch as a model running 30-plus trains on 1,400 feet of winding track journeys from Seattle to Chicago. Coal Mine: Descend the mine shaft, take a ride on the rails and learn all about the technology of coal mining. Fast Forward...Inventing the Future: This rotating gallery gives you the chance to experiment with cutting-edge innovations, like jetpacks and hover boards. ToyMaker 3000: An Adventure in Automation: A real toy factory is housed within MSI, staffed by 12 moving robots and featuring a 2,000-square-foot automated assembly line. The Art of the Bicycle: See rare and fascinating historic bicycles from the Museum&apos;s collection alongside new high-tech bikes. Henry Crown Space Center: From Sputnik to SpaceX, artifacts and interactives pay tribute to space exploration. All Aboard the Silver Streak: Pioneer Zephyr: Ride back to an historic day, on the train that would reinvent travel and design. Colleen Moore&apos;s Fairy Castle: One of the most popular film actresses of her time, Colleen Moore assembled a legion of her industry colleagues to help craft this miniature home of fantastic proportions. Extreme Ice: Through dramatic images and time-lapse video, Extreme Ice captures the pace of the world’s glaciers melting—and the immediacy of climate change. Check out more exhibits at the MSI.